The K1 Britannia project is building a replica of this most famous yacht. I have been asked about the hull colour. In her day, the ultimate, a ‘Formula 1’, she won some 231 races for the British Royal Family during here 40 year career. Fortunately for them, I asked people who had seen the yacht during her career, in particular the famous marine photographer Ken Beken who, bless him, was very helpful. I still have my dossier on the subject. Colour is of course a complex subject I’ve spent much of my life learning about, upon which from time to time I’m consulted. For example I was consulted in detail by the then curator of HMS Victory, the legendary Peter Goodwin about interior and exterior colours circa Nelson / 1805. Together we were able to prove the original colour scheme demonstrating to the consternation of many that as she was, the colours were wrong. Mr. Goodwin wrote a learned paper on that adventure, published in the prestigious “Mariner’s Mirror”, journal of The Society for Nautical Research who helped save the Victory in 1921. As the gentleman rightly wrote, Ken Beken of Cowes did kindly advise me on the the colours of Britannia and checked my painting upon completion. I still have my original dossier used when I made the painting you refer to. I can confirm ‘Britannia’ was according to Ken, not “Royal Blue”. Ken saw and approved my finished painting and as the yacht was scuttled long ago, I think it fair to say, the colour as shown is likely as close as we will ever get to correct. If people really want the best possible match, it would be advisable to have me or some one with similar background present when the paint is prepared because what is mixed is not usually what dries out. 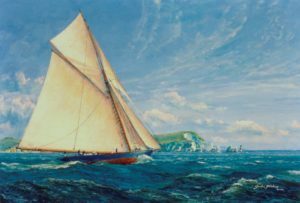 As for ‘white sails’, yes this is a typical error made by many ‘marine’ artists who try to paint from photographs without doing their homework. I guess you know, photographs can be very misleading? Ken used to get very upset when even some quite well known painters copied his photographs. A Wiley watercolour was mentioned; I would be very wary of any art work by W L Wiley especially a water colour. Although in recent years his work has gained some popularity, many consider he was not an artist of the first flight. As for the print, I have one unframed copy left and one beautifully framed which I’ve occasionally used for exhibitions including at the E U Parliament where I remain the only marine artist to have been invited to exhibit. Both prints are of a very high quality and good colour reproduction, image measuring 51 x 45 cm., £157 inc P & P. and £340 plus delivery respectively. This entry was posted on Wednesday, April 3rd, 2019 at 1:04 pm	and is filed under Marine Art, Marine prints. You can follow any responses to this entry through the RSS 2.0 feed. Both comments and pings are currently closed.